San Antonio Sports is an independent, nonprofit organization founded in 1984 with a mission to transform our community through the power of sport. That transformation takes place through three vision areas: healthy kids, places to play and events that impact. San Antonio Sports hosts sports and fitness programs for children in grades K-5 across San Antonio, with a special emphasis on underserved youth. Our innovative i play! 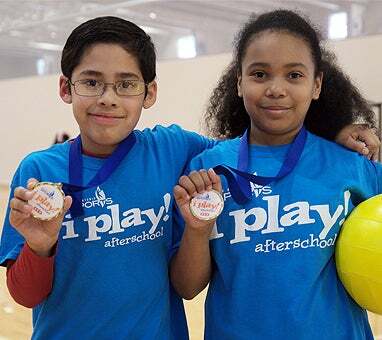 afterschool program serves 1,125 children in 45 inner-city elementary schools, teaching the fundamentals of five sports while also providing nutrition and character education. Our Go!Kids Challenge, Kids Rock Marathon Training Program and Fit Family Challenge provide fun ways to get fit. San Antonio Sports bids on and hosts national and international sporting events in San Antonio that deliver millions of dollars in economic impact and media exposure. We have hosted five NCAA© Final Four© basketball championships, and will host the 2018 NCAA© Men’s Final Four©. We also host the San Antonio Sports All-Star Football Game and other local tournaments. Our flagship fundraiser, the San Antonio Sports Hall of Fame Tribute, serves as the official induction ceremony for the new Hall of Fame class. The San Antonio Sports Hall of Fame, a gallery of bronze plaques, is located on the club level of the Alamodome. The San Antonio Sports Hall of Fame Plaza, an important point of recognition for the men and women in the Hall, is located at the north entrance of the Alamodome. San Antonio Sports advocates for the development of quality athletic facilities in all quadrants of the community. We created and manage a comprehensive community facilities plan and have led the local SPARK—school parks—effort to turn school property in underserved areas into playgrounds and park space utilized by students during the day and the neighborhood after school.